Franche-Comté: A secret gem of a new region to explore in France! Home > Blog > Franche-Comté: A secret gem of a new region to explore in France! Has anyone else heard of Franche-Comté? We have lived in France for nearly 16 years and had heard of Franche-Comté, but had no idea what an unspoiled area of outstanding natural beauty it is. Read on to discover how we spent five days in this beautifully untouched part of France. We were looking for somewhere new to explore over a five-day break, not too far from our base. 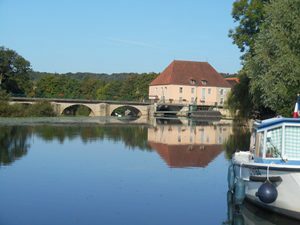 A friend told us how pretty the upper reaches of the River Saône were, so we decided to head for Scey-sur-Saône (or Scey-sur-Saône-et-Saint-Albin to give it its full name!) 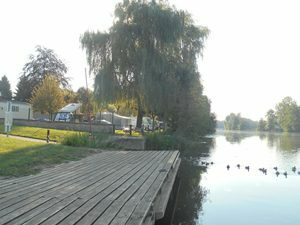 for our first night and then follow the river south heading to Auxonne. After a drive of almost three hours from our depot, we arrived in Scey-sur-Saône and from there our plans changed! We woke up on the campsite overlooking the river and found ourselves in such a stunning place that we simply did not leave for the next two days. When we did finally move on, we didn’t get very far as there was just too much to explore around every turn. 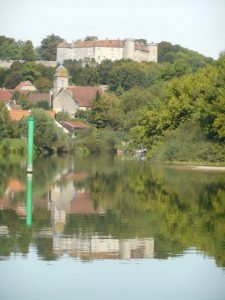 We spent the next night on the campsite at Soing (full name Soing-Cubry-Charentenay) and explored the chateau at Ray-sur-Saône, then wild camped near the river at Rigny. We spent our last night in Gray where there was another lovely campsite next to the river. 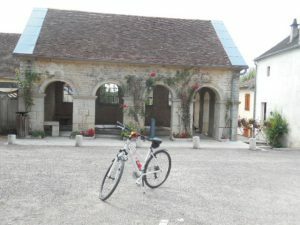 We woke up to brilliant sunshine each day and made the most of it with a bike ride on one stage of the excellent 671km-long “Charles le Téméraire V50 cycle route“. 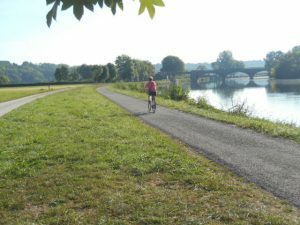 This cycle route runs alongside the River Saône for about 140 kilometres. It’s flat, smooth tarmac all the way and you can take well-charted loops of varying distances off the V50 through pretty Franche-Comté villages and bucolic countryside and passed stunning chateaux. We even stumbled across a cheese factory and very much enjoyed tasting and buying some of the local Cancoillotte cheese. I don’t think we even saw a car the whole time we were cycling. Afternoons were spent swimming in the River Saône and in the evenings we mainly lit the barbecue and enjoyed eating outdoors, with one exception. We were long overdue a fine dining experience and found an absolutely stunning chateau restaurant near Gray called Chateau de Rigny. It was ridiculously inexpensive for a posh restaurant and the service and food were first class. We didn’t make it anywhere near our target of Auxonne and finished our trip in Gray, just 50 kilometres from where we had started five days earlier! There’s lots to see and do in Franche-Comté and we are clearly going to have to go back and finish the trip when time allows. We encourage you to follow in our wheel tracks and plan a trip to Franche-Comté. Although it is less than three hours’ drive from our depot, with some great Burgundy highlights to see on the way there and back, you’ll need to allow a bit more time than we did! Read some more of our itinerary suggestions of places to visit in France.